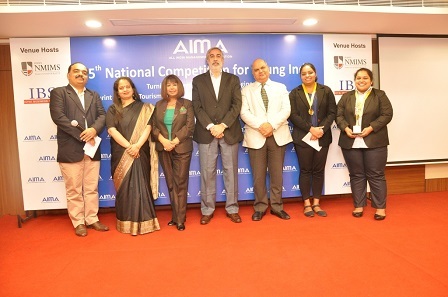 The 13th National Competition for Young India was held on the theme " Breaking Through: Making India a Creative Superpower ". The Regional Rounds started with Bangalore as the first location on 16th Nov, followed by 24th Nov in Mumbai, 28th Nov New Delhi , 30th Nov Hyderabad and 3rd Dec Chennai. This year we saw participation of more than 100 teams across the locations. The Grand Finale was held on 6th Dec 2016 at Hotel Claridges New Delhi. The Jury at the finale was chaired by Col sunil Chandra, Director Sujjan Luxury Hotel. The other Jury Members wereMr Rajdeep Sahrawat Head-International Business (Public Sector)Tata Consultancy Services, Mr J.K.Mehta Secretary General ( SAFEE) Regional Manager ,World Energy Council and Mr Sachin Kapoor Chief Operating Officer Brands of Desire. The Chief guest at the finale was Prashanth Sharma , Head Talent Management – Uflex Ltd. 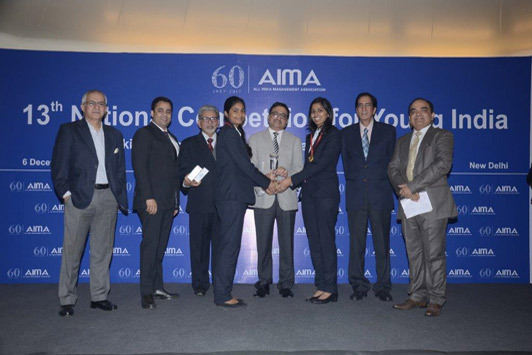 Team from Institute of Public enterprise Hyderabad (IPE) represented by Jwala Varalini and Kavyasree Kolluru emerged as the National Champions, Sharmil and Sheetal Nanjappa representing XIME Bangalore were the 1st Runners up & IES Mumbai represented by Sholoka Nayak and Kanishka Dasgupta were the 2nd Runners-up. The Best Budding Manager was given to Kavya of IPE Hyderabad.